Netherlands-based artist Hajar Benjida — also known as the author behind the wildly innovative @youngthugaspaintings Instagram account — will premiere a "Young Thug as Paintings" exhibit during Miami's Art Basel this year. The installation will be shown at the SCOPE Art Fair in Miami Beach from December 4 until December 9 and will feature numerous Young Thug photos matched with notable classical, surrealist, and renaissance artworks. 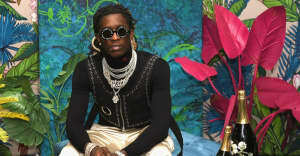 Speaking to FADER in 2016, Benjida shared that the Instagram Young Thug painting account was created as a school project. "Besides the fact that he is walking art and that I'm a big fan of him and his work," Benjida said. "I actually had no idea what to do for a school project and this was one of the first times we didn't actually have to take photos for an assignment, and the lazy person I am I really took my chance on this one."